An official statement from Indian government stating a significant increase in tiger population has resulted in more and more wildlife lovers heading towards tiger reserves all over the country. 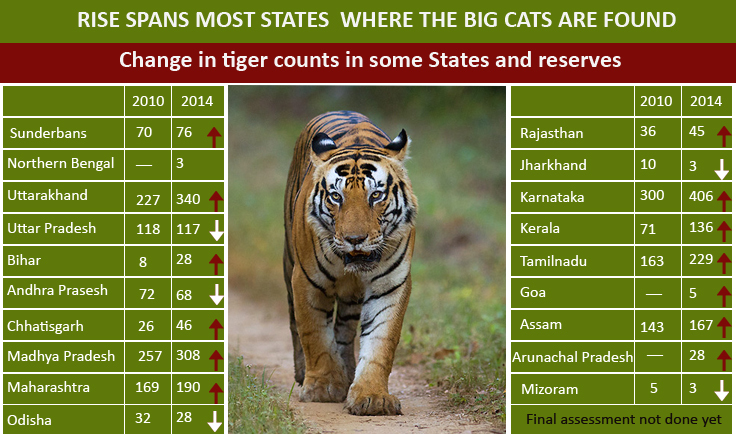 As per the latest tiger census, the population of tigers has gone up by 30% from 1706 in 2010 to 2226 currently. The demand of visiting tiger reserves had been low for the past few months, but now that the enthusiasts know about this rise in the number of big cats, the percentage of queries has increased by 40%. According to tour operators, wildlife lovers are flocking to Ranthambore, Corbett, Pench and Kanha National Park in huge numbers to have a glimpse of a tiger. And if reports are to be believed, tourists are actually getting to sight tigers. It is good to know as those who go to faraway and difficult-to-reach places are not returning empty handed. Ecstatic with this response from wildlife enthusiasts, Leisure Hotels, which maintains three resorts in Corbett National Park, is mulling over constructing properties in other tiger reserves too.